Download or view the transcript. Charter Sponsor: Active Endpoints. Also sponsored by TIBCO Software. 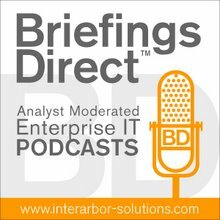 Welcome to the latest BriefingsDirect Analyst Insights Edition, Volume 43. Our topic centers on the pending purported death of corporate IT. You may recall that in the early 1990s, IT pundits glibly also predicted that the plug would be pulled on the last mainframe in 1996. It didn't happen. The mainframe continues to support many significant portions of corporate IT functions. But these sentiments are newly rekindled and expanded these days through the mounting expectations that cloud computing and software-as-a-service (SaaS) will hasten the death of on-premises enterprise IT. Some of the analyst reports these days indicate that hundreds of billions of dollars in IT spending will soon pass through the doors of corporate IT and into the arms of various cloud-service providers. We might conclude that IT is indeed about to expire. Not all of us, however, subscribe to this extent in the pace of the demise of on-premises systems, their ongoing upkeep, maintenance, and support. To help us better understand the actual future role of IT on the actual floors inside of actual companies, we're joined by our guests and analysts this week: Jim Kobielus, senior analyst at Forrester Research; Tony Baer, senior analyst at Ovum; Brad Shimmin, principal analyst at Current Analysis; Ron Schmelzer, senior analyst, ZapThink; Sandy Rogers, former program director at IDC, and now independent IT analyst and consultant, and, as our guest this week, Alex Neihaus, vice president of marketing at Active Endpoints. Kobielus: I can predict right now, based on my conversations with Forrester customers, and specifically my career in data warehousing and business intelligence (BI), that this notion of the death of IT is way too premature, along the lines of the famous Mark Twain quote. ... There aren't a substantial number of enterprises that have outsourced their data warehouse or their marts. [But] I think 2011 will see a substantial number of data warehouses deployed into the cloud. The component of your data-warehousing environment that will be outsourced to public cloud, initially, in many cases, will not be your whole data warehouse. Rather it will be a staging layer, where you're staging a lot of data that's structured and unstructured and that you're pulling from both internal systems, blogs, RSS feeds, and the whole social networking world -- clickstream data and the like. Baer: I just completed actually a similar study in application lifecycle management (ALM), and I did find that that cloud certainly is transforming the market. It's still at the very early stages, but ... two areas really stuck out. One is anything collaborative in nature, where you need to communicate -- especially as development teams go more global and more distributed -- ... [and] planning, budgeting, asset management, project portfolio management, and all those collaborative functions did very well [in the cloud]. Another side that did very well ... is anything that had very dynamic resource needs where today you need a lot of resource, tomorrow you don't. A good example of that is testing -- if you are a corporate IT department, which has periodic releases, where you have peaks and valleys in terms of when you need to test and do regression test. [But] I got a lot of reluctance out there to do anything regarding coding in the cloud. ... So, in terms of IT being dead, well, at least with regard to cloud and on-premise, that's hardly the case in ALM. Shimmin: Because I follow the collaboration area, I see [cloud adoption] happening much, much more quickly. ... Those are the functions that IT would love to get rid of. It's like a diseased appendix. I would just love to get rid of having to manage Exchange Servers. Any of us who have touched any of those beasts can attest to that. So, even though I'm a recovering cynic and I kind of bounce between "the cloud is just all hype" and "yes, the cloud is going to be our savior," for some things like collaboration, where it already had a lot of acceptance, it's going to drive a lot of costs [out]. Schmelzer: It's really interesting. If you look at when most of the major IT shifts happen, it's almost always during period of economic recession. ... Companies are like, "I hate the systems I have. I'm trying to deal with inefficiency. There must be something wrong we're doing. Let's find some other way to do it." Then, we go ahead and find some new way to do it. Of course, it doesn't really solve all of our problems. The cost-saving benefit of cloud is clearly there. That's part of the reason there is so much attention on it. People don't want to be investing their own money in their own infrastructure. They want to be leveraging economies of scale, and one of the great things that clouds do is provide that economy of scale. ... On the whole question of IT, the investments, and what's going to happen with corporate enterprise IT, I think we're going to see much bigger changes on the organizational side than the technological side. It’s hard for companies to get rid of stuff they have invested billions of dollars in. ... IT organizations will become a lot smaller. I don't really believe in 4,000-person IT organization, whose primary job is to keep the machines running. That's very industrial revolution, isn't it? Rogers: I see enterprises all the time that are caught between a rock and a hard place, where they have specialized technologies that were built out in the client-server era. They haven't been able to find any replacements. The ability to take a legacy system that may be very specialized, far reaching, have a lot of integrations and dependencies with two other systems, is a very difficult change. ... When we're talking about cloud and SaaS, it's going to impact different layers. ... We may want to think about leveraging other systems and infrastructure, more of the server, more of the data center layer, but there is going to be a huge number of implications as you move up the stack, especially in the middleware and integration space. We're still at the very beginning stages of leveraging services and SOA, when you look at the mass market. ... There's a lot of work that needs to be done to just think about turning something off, turning something on, and thinking that you are going to be able to rely on it the same way that you've relied on the systems that have been developed internally. It's not to say it won't be done, but it certainly has a big learning curve that the whole industry will be engaging in. Neihaus: What we find more interesting is not the question of whether the cloud will subsume IT, or IT will subsume the cloud, but who should be creating applications? ... There is a larger question today of whether end users can use these technologies to completely go around IT and create their own applications themselves. For us, the cosmic question is whether we are really at the point where end users can take elements that exist in the cloud and their own data centers and create processes and applications that run their business themselves. the reasons that everyone discussed. ... The question really is whether the combination of these technologies can be made to foster a new level of collaboration in enterprises where, frankly, IT isn't going to go away. The most rapid adoption of these technologies, we think, is in improving the way IT responds in new ways, and in more clever ways, with lot more end-user input, into creating and deploying applications. For us, the cosmic question is whether we are really at the point where end users can take elements that exist in the cloud and their own data centers and create processes and applications that run their business themselves. And our response is that that's probably not the case, and it's probably not going to be the case anytime soon. If, in fact, it were the case, it would still be the wrong thing to do in enterprises, because I am not sure many CEOs want their business end users being IT. Kobielus: You need strong governance to keep this massive cloud sandbox from just becoming absolute chaos. So, it's the IT group, of course, doing what they do best, or what they prefer to be doing, which is architecture, planning, best practices, templates, governance control, oversight support, and the whole nine yards to make sure that, as you deal in new platforms for process and data, such as the cloud, those platforms are wrapped with strong governance. Baer: You can't provide users the ability to mash-up assets and start creating reports without putting some sort of boundary around it. This is process-related, which is basically instituting strong governance and having policies that say, "Okay, you can use these types of assets or data under these scenarios, and these roles can access this and share this." Rogers: The sophistication of the solution interfaces and the management in the administrative capabilities to enable governance, are very nascent in the cloud offerings. That's an opportunity for vendors to approach this. There's an increasing need to compose and integrate silos within organizations. That has a huge implication on governance activities. Gardner: I'd like to go around the table, on a scale of 1 to 10 where do you think we're going to see the IT department's role in three years -- with 1 being IT is dead, and 10 being IT is alive, robust, and growing vibrantly? Kobielus: I'll be really wishy-washy and give it a 5. ... IT will be alive, kicking, robust, and migrating toward more of a pure planning, architecture, and best practices function. Much of the actual guts of IT within an organization will migrate to hosted environments, and much of the development will be done by end users and power users. I think that's writing on the wall. Baer: I am going to give it an 8. ... I don't see IT's role diminishing. There may be a lower headcount, but that can just as much be attributed to a new technology that provides certain capabilities to end users and also using some external services. But, that's independent of whether there's a role for IT, and I think it pretty much still has a role. Shimmin: I'm giving it a 7 for similar reasons, I think that it's going to scale back in size little bit, but it's not going to diminish in value. In some enterprises, IT is in deep trouble if they do not embrace new technologies and new opportunities and become an adviser to the business. changing to be more of business analysts, if you will, working with their end users too. Those end users are both customers and developers, in some ways, rather than these guys just running around, rebooting Exchange servers to keep the green lights blinking. Schmelzer: I think it's 10. IT is not going to go away. I don't think IT is going to be suffering. ... I guarantee that whatever it looks like, it will be still as important as an IT organization. Rogers: Probably in the 7 to 8 range. ... In some enterprises, IT is in deep trouble if they do not embrace new technologies and new opportunities and become an adviser to the business. So it comes down to the transition of IT in understanding all the tools and capabilities that they have at their disposal to get accomplished what they need to. Some enterprises will be in rough shape. The biggest changeover is the vendor community. They are in the midst of changing over from being technology purveyors to solution and service purveyors. That's where the big shift is going to happen in three years. Neihaus: Our self-interest is in a thriving a segment of IT, because that's who we serve. So, I rate it as a 10 for all of the reasons that the much-more-distinguished-than-I panel has articulated. The role of IT is always changing and impacted by the technologies around it, but I don't think that that could be used as an argument that it's going to diminish its importance or its capabilities really inside organizations. Gardner: Well, I'll go last and I'll of course cheat, because I'm going to break it into two questions. I think their importance will be as high or higher, so 8 to 10, but their budget, the percent of spend that they're able to derive from the total revenues of the organization, will be going down. The pressure will be on from a price and monetary budgeting perspective, so the role of IT will probably be down around 4. IT is DEAD! With the potentially demised of computers in the near feature, it is still to be seen what will take its place.